There’s a big difference, though. A few years ago, when I was offered the chance to write short biographies of Newton and Einstein, I jumped at it – because they addressed mysteries of the universe that anyone can relate to, and their lives outside physics were, if anything, even more fascinating. At the risk of sounding downright rude, you can’t say either of those things about James Clerk Maxwell. In spite of that, Brian Clegg has done a wonderful job here of recounting just what Maxwell achieved – and how he went about it, and why it puts him on a par with the other greats. The book’s most unusual feature is hinted at in the title. This is a reference to the thought experiment of ‘Maxwell’s Demon’ – which seems to show how (to put it in modern terms) an artificial intelligence equipped with sufficiently high-resolution nanosensors could overthrow the second law of thermodynamics (the one that says entropy can never decrease). Clegg brings the demon to life, allocating something like a fifth of the total page count to first-person ‘demonic interludes’ – providing background-filling flashbacks and flashforwards – supplemented by copious footnotes on the main chronological narrative. The demon’s writing style is a slightly more whimsical version of Clegg’s own, so the overall effect is rather like the author putting on a demon mask and continuing to speak in his own voice. That would be an entertaining way to lighten a heavy subject in a public lecture, and it’s just as effective here. But even the presence of a reader-friendly demon can’t hide the fact that this is a book about physics. With Newton you can soften the blow by talking about his alchemical studies, with Einstein there’s his political campaigning, with Galileo his battles against the church, with Hawking his battles against disability. But with Maxwell there’s nothing like that. He had a nice sense of humour, a few harmless pastimes, a happy marriage – and beyond that, his life was all about physics. Fortunately that doesn’t make this a textbook, not by a long shot. The focus isn’t so much on the details of Maxwell’s work, as on how he went about it and how his mind worked. The result is a fascinating read for anyone who’s already had the textbook inflicted on them – or perhaps come across Maxwell’s name in some other context – and wants to see how it all links together as a historical narrative. Because he did so many different things, everyone is going to learn at least a few new facts. How many people know that Maxwell produced the first colour photograph, or devised the unit of electrical resistance, the Ohm, or created the science of control theory, later renamed cybernetics? 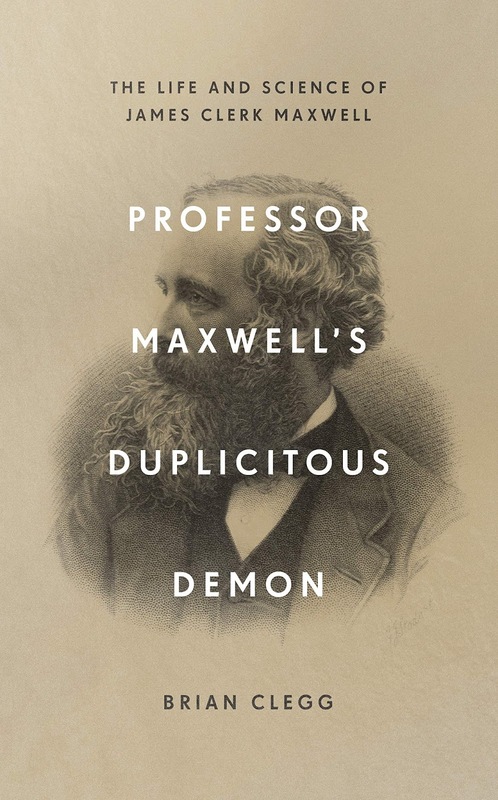 In one of the demonic interludes, Clegg has the demon assert that 78% of the book’s readers had never heard Maxwell’s name before they picked it up. He immediately admits he made the number up, and I don’t believe it for a moment. Maybe 78% of the general population have never heard of Maxwell, but readers are self-selecting. The ones who pick this book up are likely to come at it with at least some awareness of Maxwell’s existence – and a curiosity to learn more about his life and work. And they won’t be disappointed.